One hundred bushels of corn are to be divided among 100 persons. men get 3 bushels each, women 2 and children 1/2. how many men, women and children are present? This solution also makes sense (m=6, w=22, c=72). Clearly, there can be several correct solutions to this question. What is 43 over 100 as a decimal. The answer is forty three hundredths, which is written as 0.43. If you have 26 choices for each letter in a word, then there are 26 such one-letter words, 262 two-letter words, 263 three-letter words, etc. There would be 268 eight-letter words. There would be 267 eight-letter words that end with the letter N, which is the same as the number of 7 letter words (just add “N” to the end of each seven-letter word. There would be 266 eight-letter words that begin with R and end with N (just add R to the front and N to the end of all six-letter words. There would be 2*267 eight-letter words that begin with an A or B (add A to the beginning of every seven-letter word, then add B to the beginning of every seven-letter word). There would be 2*267 eight-letter words that begin with A or end with B (add A to the beginning of every seven-letter word, then add B to the end of every 7 letter word). To calculate y, you can plug in x. If y=3x-1, then the given values of x will result in the pairs (0,-1) (2,5) (-1,-4). If y=3-2x, then the given values of x will result in the pairs (-1,5) (0,3) (1,1). If y=2x+1, then the given values of x will result in the pairs (0,1) (-1,-1) (1,3). 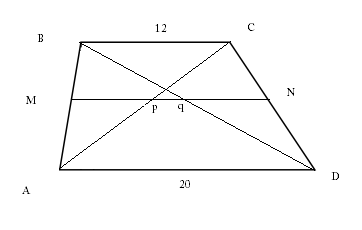 In trapezoid ABCD the median MN cuts diagonals AC =D at p and q repectively, BC=12, and AD=20 Determine PQ please explain your steps. i know the median is 16 and I know the correct answer is 4, I know there is a formula but we have not proved it. We also know that the distance of Mp = 6, because it just be half the length of BC (the sides of triangle AMp are half the size of the sides of triangle ABC because the triangles are similar and we know that AM is half the length of AB since MN is the median).Similarly,the length of qN = 6.